Make sure to tell your story. As the Mom and a Scrapbooker I’m the one who’s telling my family’s story. I’m also usually the one taking all the pictures. Sometimes I’m even in the pictures. 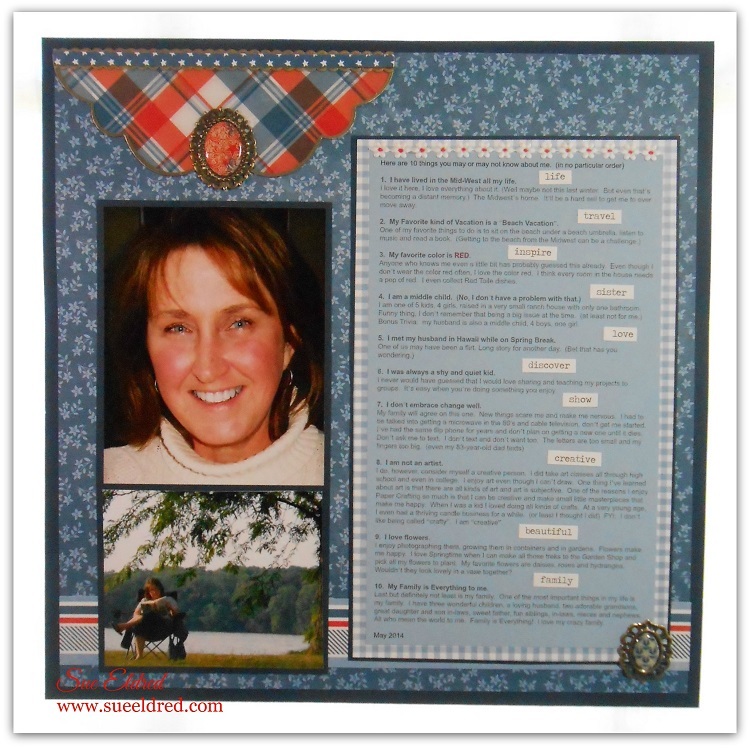 As a scrapbooker, one of the things I’ve never done before was to do a layout on “ME”. Hopefully one day, my kids or grandkids might enjoy reading a little bit about me. Isn’t that why we do it? To tell our “story”. I used that post as the starting point for this layout. I like to use things in ways other than how their supposed to be used. For this layout I used one of the scalloped shapes from the Send it Clear card kit from Clear Scraps. Once I glued the scrapbook paper to the clear scallop, I edged around it with a gold paint pen. I love how it’s a subtle enhancement for my page. I glued a small medallion onto the tip of the scallop. The paper is from the “Americana” collection from Pebbles Inc. I also used Tim Holtz’ “Chit Chat” stickers to emphasize certain words in my story. It’s simple and it’s me!